Horse farms and ranches may be one of two different kinds of facility: they may be places where horses are bred and raised, or they may be places where horses are boarded and trained. There are still a few existing ranches in the U.S. where horses are used for agricultural purposes, generally herding cattle, but these grow rarer with each passing year. Most people visit a horse ranch either to purchase a horse or to board their own horse. Horse maintenance is beyond the capacity of urban households, so some owners stable their animals in the countryside, at a place where horses have knowledgeable people to care for them. Sometimes people buy horses and need to have them trained; rather than having a trainer visit their home, they arrange for boarding at the training facility. If you're considering using the services of a horse ranch, there are several things you should do before making a final choice. Call the local Humane Society and ask if there have been any problems associated with any ranch you're considering. 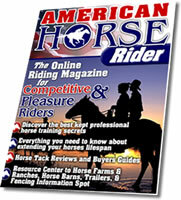 Ask knowledgeable people such a veterinarians, riding teachers and trainers to tell you what they know about the place. 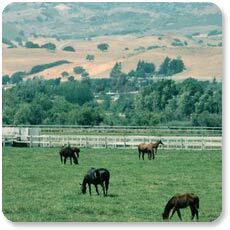 Get expert advice and information on ranches that might best suit your needs. Visit the place in person to get a sense of how things are run and the sort of people who work there. Is the place clean, and has the maintenance been good? How is exercise and training conducted? Is there plenty of space in stalls, barns, paddocks and pastures?